Want to make your photographs of famous landmarks stand out? Discover these tips from eleven pro photographers to make your images one-of-a-kind. Elliott Erwitt photographed the silhouette of a man with an umbrella jumping over a puddle in front of the Eiffel Tower. During the construction of Rockefeller Center in 1932, an anonymous photographer created that iconic photograph of eleven men eating lunch on top of a steel beam over the instantly recognizable 41st Street in Manhattan. In 1983, Steve McCurry captured a steam engine in the foreground of the Taj Mahal; in 1999, he photographed the same mausoleum reflected in water. Photographs of famous places are a dime a dozen. According to this list compiled in the spring of 2017, the top five most Instagrammed landmarks—the Eiffel Tower, Big Ben, the Louvre, the Empire State Building, and the Burj Khalifa—have all been photographed millions of times in the last four years alone. Unique pictures of the world’s most photographed places don’t only stand out. They withstand the test of time. Think of Erwitt, McCurry, and “Anonymous.” We asked eleven extraordinary photographers to take us around the world. Here, they share their memories of capturing places that have been photographed countless times before, and they offer their best tips for making fresh pictures of well known landmarks. Image by Songquan Deng. Gear: Nikon D800 DSLR camera, Nikon 14-24mm f2.8 wide angle lens at 14mm. I took multiple shots (3 in one bracket group [-1ev, 0, +1ev], 51 shots in total) and stitched them together into one panorama. Tell us about a time you photographed a very famous landmark. How did you capture it in a fresh and unique way? The bell tower in San Marco’s Square is one of the most recognizable landmarks on the magical island of Venice. As the heart of Venice, it’s always full of people. You can find millions of photos with tourists everywhere. I didn’t want to add one more to that gigantic collection. Instead I woke up at 4:00 in the morning, and I arrived at the square when the whole city was still in deep sleep. All the people were gone. The bell tower and Saint Mark’s Basilica stood silently in front of me, just like they had for hundreds of years. In that moment, the whole square belonged only to me. It rained slightly outside. I moved back to the hallway to observe the scene in front of me. The arches became excellent frames with the bell tower in the middle. The square-shaped tiles on the ground—with scratch marks left by history—offered amazing patterns. The cool, cloudy sky and warm hallway lights added vivid colors to the picture. I took multiple shots and stitched them into one panorama in post-processing with a perspective of more than 180 degrees to cover both ends of the hallway. Technically, this panorama was among the most challenging and time-consuming ones I have ever made in post-processing, which differentiates it from the millions of shots people have taken of this well-known square. The well known landmarks usually have a large crowd during normal hours. To shoot something different than a regular tourist snapshot I always get there early in the morning when most people are sleeping. The scene is quiet without people, which allows me to get into a zen-like mood and identify interesting and unique elements. The lines, curves, colors, and shadows that would otherwise be ignored due to the distractions add to the uniqueness of my photographs. Focusing on the scene and subject I plan to photograph and getting into a peaceful mood allows me to observe and think as a photographer and to explore the soul hiding behind the bricks and marble of these historical landmarks. Image by Sidra Monreal Photography. Gear: Nikon D90 camera, 18-105mm 4/3.5-5.6 lens. Settings: Focal length 42mm; exposure 1/400 sec; f10; ISO 200. The beautiful view of Prague Castle and St. Vitus Cathedral has been photographed many, many times before. Rather than taking the expected route, I decided to focus on a flock of pigeons that I found perched upon the Charles Bridge and to include the castle and cathedral blurred in the background but still prominent. Pigeons are some of my favorite subjects in cities. They are always there, if you look for them, ready to make a photograph more interesting. Famous landmarks stay the same, but the things around them change constantly. Find that thing that is different and include it in your photograph, whether it is the changing colors of a nearby tree in the foreground or an unusual cloud passing over. It could be flowers blooming in front of the Eiffel Tower or water from a recent rainfall dripping off of a statue. Finding those variables is a great way to capture a fresh perspective of something that has been photographed millions of times before. You just have to keep your eyes open to these details. Everywhere. When I have my camera around my neck, everything becomes a potential subject. Everything instantly becomes more interesting when you have your eyes open and your creativity flowing. I look for the way the light hits things and I look at the way the shadows fall. I look at what animals are doing and what they are interacting with. The whole world is a source of wonder. Image by PHOTOCREO Michal Bednarek. Gear: Canon 5D Mark II camera, Canon 24-105 f/4L IS USM lens. Settings: Focal length 24mm; exposure 1/20 sec; f11; ISO 200. Tell us about a time you’ve photographed a very famous landmark. How did you capture it in a fresh and unique way? I photographed London with the clear aim of capturing the soul of this amazing and bustling city. In order to avoid taking cliché postcard photos I decided not to wait for a boring, blue, sunny sky. Instead, I tried to embrace the weather conditions as they were. It was a very windy and rainy week in London. I was probably the one and only photographer with a tripod on the Westminster Bridge on this late afternoon. The weather was really uninviting. I waited for a few hours, wearing a warm, waterproof field coat. Just before sunset, the wind must have blown away a few clouds over Big Ben, making the sky dramatic. There were various layered clouds. I waited for a few minutes until a red bus came. Two of them came—just one after the other! A red bus in London sounds cliché, but with the unusual lighting, dramatic sky, and good framing, I ended up with a unique photograph. Post-processing is equally important. I added some vintage tone, dehazing, and clarity in Camera Raw to better show the mood of the image. Try to avoid taking another postcard photograph. Don’t get frustrated when the weather is not as you imagined. Embrace the moment and the spirit of the place, and be patient. Don’t only think one dimensionally; think about the foreground and background as well. Place your landmark in the middle of the movement or action. Before every trip, I clear my mind of any images of a landmark. I don’t want to mimic anything, even subconsciously. For the first part of the trip, I photograph and imagine. In the second part of the trip, I Google the place and look at both modern and historical photos of the landmark. I just let the inspiration float into my mind as I browse the catalogs. Remember that inspiration never means copying! Image by Taras Vyshnya. Gear: Canon 6D camera, Canon EF 17-40mm F/4L USM lens, neutral density gradual filter, aluminum tripod. Settings: Focal length 40mm; exposure approximately 6 sec; f13; ISO 100. This is a series of 3 horizontal shots later stitched into a panorama. This cityscape includes the Sydney Harbor Bridge, Opera House, and CBD high rises. The length of the coastline of Sydney Harbor offers plenty of options and good spots to photograph from. It also presents one of the challenges: which is the best one? Naturally, all three elements of the skyline should be presented together to form a strong and appealing outlook that will be appreciated by designers and customers. Another important consideration is the light and time of day. Nothing beats the soft light of golden hour. With proper weather and interesting clouds this could result in remarkable results, especially when combined with the artificial illumination of the buildings. Careful blending of natural and artificial light is crucial for decent outcomes. And finally, capturing the scene in a wide panorama format gives a bit of a fresher perspective than a conventional single image. Use the best light during the blue and golden hours. Aside from the lighting conditions, these times also have the advantage of smaller crowds and easier access to the best spots. The same place at 5:00 in the morning and 10:00 in the morning will look completely different. Additionally, famous landmarks might have artificial illumination which is best observed during the blue hour. Be mindful, though, that some landmarks might not be illuminated at sunrise, like the Sydney Harbor Bridge, or they might not even be accessible until opening hours, like the Forbidden Palace in Beijing. Some landmarks are great only under clear skies, but some might benefit from interesting clouds or look good immediately after the rain. And of course some less frequent weather events like a rainbow, a flash of lightning, the Northern Lights, or even the moon could add some uniqueness. Something that drives me further is if after a session, when reviewing the results, I can say “wow” to some of my works. The ability to see and experience the same place again and to get aesthetic satisfaction from something that I produced myself is inspiring. Secondly, I draw inspiration from the appreciation of other people, either face-to-face or via social media platforms. Instagram, Facebook, Twitter, and Shutterstock are places to look for such feedback and inspiration. I once saw my work used as the title photo for an event at a professional conference. It was a very touching moment. Not even because I had earned something from that sale, but because I’d personally seen the appreciation of my humble skills in a real-life situation. Another driving force is the opportunity to travel. Capturing those moments and saving them for later is very appealing. Seeing the works of others and observing ads and marketing materials in our daily lives also gives us ideas and pushes us to do better in our own work. And finally, financial reward. Getting my best works accepted by Shutterstock, growing sales, and being able to convert hard-earned money into new photo gear and the ability to travel without impacting my family budget is very inspiring. Image by Mihai Andritoiu (mandritoiu). Gear: Canon EOS 5D Mark III, Canon EF 24-70mm f/2.8L II USM lens. Settings: Focal length 24mm; exposure 121 sec; f16; ISO 50. This is one of my most popular photos these days. It depicts one of the most spectacular mountain roads in the world: Transfagarasan, a winding road connecting Transylvania to the southern part of Romania across the Carpathian mountains. It is a famous Romanian landmark and an extremely popular tourist destination, maybe too popular, these days. There is homework and preparation involved in almost all of my photos. The “decisive moment” works very rarely for me. I spend time studying the work of other photographers, and I spend time identifying the best spots well ahead of time through Google Maps/Earth. Obviously, I plan on shooting around sunset and sunrise (or at night for cityscapes), when the colors are the most appealing. I check the weather conditions and I check where the sun or moon is expected to be, and I plan accordingly. There is little time to make big decisions on site, and often we don’t get second chances to go back and try again. My strategy is to attempt to make the difference in post-processing. This is where the creativity can be unleashed, provided a solid processing technique is mastered. In today’s digital era, photography is not so much “painting with light,” as it was during the film days, as it is “post-processing with light.” This is what really makes the difference. Famous places are photographed over and over again by thousands and thousands of photographers from every conceivable angle. While coming up with something new is still possible it is not very probable. For that reason, I embrace existing work and search for what I consider to be the best photos taken from any given place, and I use them as inspiration. I spend a lot of time at the actual spot. While I’m waiting for the best light, I’m shooting frantically, bracketing, experimenting with various compositions, using filters and not using filters, and getting backup shots with different focal points. I’m basically trying to score all that’s needed during the field trip to allow for a proper selection at home, in a relaxed environment without pressure. I probably end up using only a tiny fraction of my memory card to come up with the best photo I’m capable of creating. On very seldom occasions I might have a second version, but only if it is significantly different from the first one. Shutterstock already has a very competitive collection of excellent photos! I always do my homework and figure out what my fellow contributors were able to come up with. Besides that, I’m continuously looking for new techniques. The satisfaction of discovering new methods and experimenting with new ideas keeps me motivated and inspired. Additionally, it is very rewarding to see customers spending real money on my work. This is the real appreciation in my eyes. Being a successful contributor keeps the motivational engines running smoothly. Image by Frederic Prochasson. Gear: Canon EOS 5D Mark III camera, Canon EF11-24mm f/4L USM lens, tripod. Settings: Focal length 11mm; exposure 1/20 sec; f11; ISO 50. Bracketing 7 shots. There is so much for one man to see and to photograph that I will never have enough time. But of course, the most famous sites are not photographed by one man but by thousands! How, then, to realize a different and unique image? This is where every detail counts: the choice of framing, timing, and post-processing. Everything must be studied, planned, and controlled. Take for example the Colosseum in Rome. Of course, before I went there, I looked at existing photos and formed an initial idea of ​​what I wanted to do and how I wanted to do it. I looked at the strongest points in these other photos and also the weak points in order to achieve the most perfect photo possible. For the Colosseum, I wanted a picture at sunrise with no one in the picture. It was therefore necessary to choose a time of year when the sun rose early enough that there were still no people in the streets. It was in June. I scouted the area a few days before the shoot to see where the sun rose and position it exactly where I wanted it in the image. I chose the Canon 11-24mm lens at 11mm. This allowed me to have very little deformation, straight walls, and no downward plunge, unlike what you see with most existing photos. Of course, shooting is only part of the job. When I got home, I started post-treatment. I used seven images to get the final result. In the end, I managed to release a unique image that’s significantly different from what already exists. It is not easy to make an original image of a much-photographed site. That comes when you put in the work. We must learn from what exists. We must study what works and also what does not work. Often many images of the same site have the same defect. Find it and correct it. 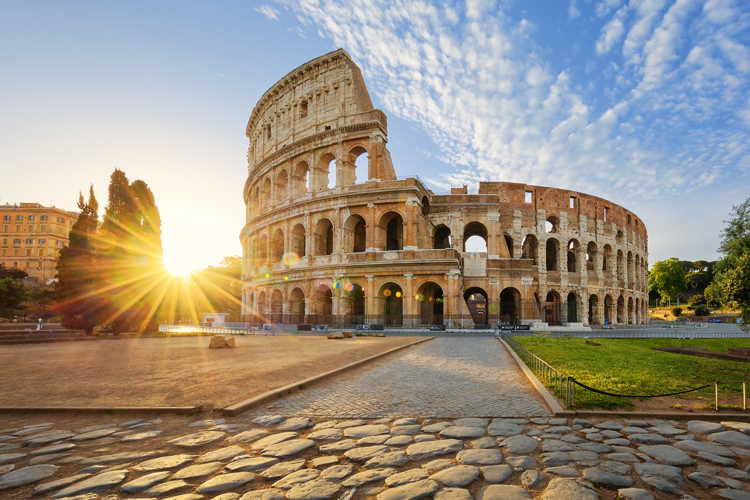 What is the main fault in images of the Colosseum? The walls are not straight because the monument is wide and high. You have to take the best pictures of a site and add something extra. Be observant, be demanding, and give yourself the means to do it! I know myself, I know my equipment, and I know what I can do. That’s the base. But that’s not enough to stand out. To do better, to go further, to excel, I look at what has already been done at a site that I want to photograph. I look for an image that makes me say to myself, “Wow, how did he do that?” I study, I learn, and I give myself the means to do better. We are never the best in photography, but to be among the best, we must want to surpass ourselves. Image by Sergii Kolesnyk (givaga). Gear: NIKON D800 camera, Nikkor AF-S 24-70 f2.8 lens. Settings: Focal length 95mm; exposure 1/2 sec; f8; ISO 200. This single-row panorama is made of 6 photos. I photographed the Hagia Sophia early in the morning, at 5:12, from the window of my hotel room on June 14th, 2017. Before shooting this famous object, I searched for a suitable place with the help of Google Maps. I calculated the place and the time of the sunrise, and in the end, I found a suitable hotel and took one of the rooms with a panoramic view. This foreshortening and magical morning light helped me to photograph the Hagia Sophia in a way that was unlike the rest of the photos. Look for interesting views in advance. Google Maps will help you very much. Watch the sun because the object will be illuminated in different ways at different times of the year and at different times of the day. Do not forget about Photoshop. It can help you make your photo unusual. My most important piece of advice is to love what you do and practice regularly. In my youth, I studied at an art school, and, of course, the initial inspiration is given to me by talented artists. I always bring small pictures by local artists home with me in memory of my travels. These paintings leave a long-lasting memory of the places I visited. I look at photos by good photographers. And, of course, the journey itself is very inspiring. But be careful: travel is contagious! Image by Vichaya Kiatying-Angsulee (vichie81). Gear: Canon EOS 5D Mark III, EF 70-200 f4 L IS USM lens. Settings: Focal length 85mm; exposure 8 sec; f9; ISO 160. I started photography because I love to travel, so most of my photographs were shot from a viewing spot or observatory desk like other tourists. But I wait for the best moment for each shot. The moment that I love most is after sunset when the natural light is a bit darker than the street lights, making the landmark look more bright and dominant. I always use a tripod, set up the composition, and then wait. Sometimes I’m waiting for a car to stop at a junction, or I’m waiting until a car moves out of my frame. Sometimes I wait for pedestrians to walk away, and sometimes I have to wait for the wind to slow down so that a boat in the bay doesn’t shake. All of this helps me to get a clear and neat photograph. This photo is from Marseille—the famous European harbor view of Notre Dame de la Garde. Do some homework before traveling. Find some reference photos with a Google search and a Shutterstock search. Using Google Maps, I’ll know where the photo can be shot from, and I’ll know what lens is appropriate. After I arrive, I’ll go to a souvenir shop to find some postcards. When I see more photos, I might find a new spot that I should go to. Study the rules in each place. For instance, in some places I cannot use a tripod, etc. Be prepared for those situations. Arrive early. I always arrive about two hours before the time I want to photograph so I can find the right spot. Know your gear. Each camera and lens has different characteristics. When I know the gear and its limitations, I can get the best shot possible. Everywhere. Like I said before, I love traveling around the world, and I love seeing new places. I would like to travel everywhere in the world. Whenever a destination on my list has an air ticket promotion, I book it. Image by Nattee Chalermtiragool. Gear: Sony A7 Mark II camera, Sony FE 16-35 mm F4 lens. Settings: Focal length 35mm; exposure 5 sec; f8; ISO 100. Before traveling, I look for images of the landmark from many photographers, and I think about what perspective could be unique and different. I took this photo at sunset in Oslo in early summer, around 10:00 p.m. The best time for a photo shoot is around 10:30 p.m. Prepare your gear: tripod, battery, memory card, etc. Everything must be ready. Check for the exact time of the sunrise or sunset. My favorite times for shooting are about a half an hour before sunrise and after sunset. I look for inspiration in beautiful images in magazines, travel websites, and blogs. Image by Det-anan Sunonethong. Gear: Nikon DF camera, Nikkor 14-28mm f/2.8N lens. Settings: Focal length 24mm; exposure 1/200 sec; f13; ISO 200. This photo was taken at Mesa Arch in Canyonlands National Park, USA. We arrived at about 5:00 one morning in the beginning of May. The sky was still dark, and the weather was cold and windy. There were a few photographers already there. We walked around and took some photos quickly to find the best spot. Finally, we found our spot and just put the tripod there. Then we waited for an hour for the right moment to shoot this landmark. When the first light hit the arch, it looked almost like the arch could illuminate the surroundings by itself. I shot only a few photos. After that, I took my eyes off of the viewfinder and enjoyed the beautiful moment with my own eyes. This morning was one of the most memorable mornings of my life. I like to photograph during twilight. Before I make a trip, I always check the internet to see where exactly I should go to get the photo I’m imagining. In addition, I check the weather forecast in advance and plan the date and time for the shoot. Many people will just go to a landmark without a plan, take a photo, and later claim their photo does not look like a postcard or a magazine. In order to get those beautiful shots, you need to prepare. Try to arrive at the place early so you can walk around and find the best spot for your photograph. Do not shoot the photo from the first spot you see. There is always a better spot. Another tip is to use a wide-angle or telezoom lens. This will make your photo more attractive to viewers because the perspective from these lenses cannot be achieved by the human eye. Also, do not forget to bring a tripod for taking photos in low-light conditions. I love to travel and witness beautiful places with my own eyes. I like to show the wonderful world to other people through my photos. As people say, one photo is worth a thousand words. Additionally, my passion comes from other photographers. I like to learn tips from others in order to develop my skills as a photographer. Image by Beatrice Preve (ventdusud). Gear: Nikon D800 camera, Nikkor 24-70 mm f/2.8 lens. Settings: Focal length 26mm; f11; ISO 100. 3 exposures for bracketing: 1/60, 1/125, 1/30 sec. The Golden Gate Bridge in San Francisco is often photographed, but what I like about photography is finding myself in the most beautiful places in the world when it’s my turn to capture them. When photographing I think about the present situation: How is the light in this moment? Where are the clouds? I was careful with the details like the metal, the grass on the hill, and the sunny city in the distance. What is interesting about this place is the game of colors. This red bridge becomes brighter with the amazing light at the end of the day. Try to capture the specific moment. Something will always happen in the moment that will never happen again in the future. It’s like the fire in a chimney: it is always the same, but at the same time, it is constantly fascinating! I feel very grateful to have the chance to be here. Any moment can become almost meditative for me. Even if a landmark is photographed often, every moment is unique. That’s what’s most interesting: to be in the here and now. Top Image by Det-anan Sunonethong.